April 22 has been declared Earth Day. It is important to reflect regulary on our consumption habits and try to reduce the impact on our planet. Every little bit helps, and therefore we can, despite all the negative posts, no matter how small, do an effort to cope better with our environment and contribute also to a cleaner world for everyone. Less intensive stock breeding, less meat, means less warming, less animal suffering and more life on earth. Try a Pita of the vegetarian butcher. With a delicious garlic sauce and some fresh raw vegetables, this is a surprisingly tasty, balanced lunch. Lavender bags in wardrobes, lemon peels in a bowl of vinegar in the refrigerator, sodium bicarbonate with a drop of tea-tree oil in the litter box, selfmade air freshener … This is all natural stuff in order to obtain pleasant scents without using harmful chemicals. Translation for a natural air freshener: 200 ml of distilled water, 2 tabelspoons Wodka and 20 drops of your favorite essential oil together in a plant sprayer and shake well … ready. Do we really need all those artificial perfumes, lotions, creams, soaps, gels? Just click on the site of Skin deep. With a little searching you can find all the ingredients of your own products. You will be surprised how much trash manufacturers put in their products. .. On the other hand, jojoba oil, is a real little tresor for our skin and the price is nice. It sounds weird but this ” oil” is both particularly well for oily skin that tends to acne and dry skin. It doesn’t feel greasy at all and just a little bottle gives you months the best care you can imagine. With a little creativity you can certainly find more challenges… and that will give you a fine and happy feeling! Also much closer, in the Belgian Ardennes, the wood anemones (also called windflower, thimbleweed, or smell fox) now make a beautiful white carpet. It only takes just a few weeks but I love to see this, every year again. In other places in Belgium, dominate the purple color of the Bluebells. Flowers are not only beautiful to look at, there are several types you can eat. The cheerful orange Nasturtium (Indian cress or monks cress) tastes delicious (a bit like radishes) and they brighten up your risottos and fresh salads. Let’s show some examples of tiles with a lot of organic tangles: here is a Renaissance Zendalatile with on the top right Laflor, Abeko, Curly Q, String Rose, Boxwood, Printemps, Alabastro, Flux and Morning Glory. Ikebana or Japanese flower art is very elegant but more difficult than it seems at first sight. Here too I found inspiration to create a tile with flowers. Eastern Lily is the star along with Fricle and Eddy. Helen Williams, a very talented lady from Australia has an interesting blog where you can find many organic tangles. There I saw for the first time to draw gridtangles not always straight but in a in a more “wonky grid ‘. Below an attempt with Florez, surrounded by a few Pokeleafs and dewdrops. The fun pattern Plum-lei looks a bit like a violet. 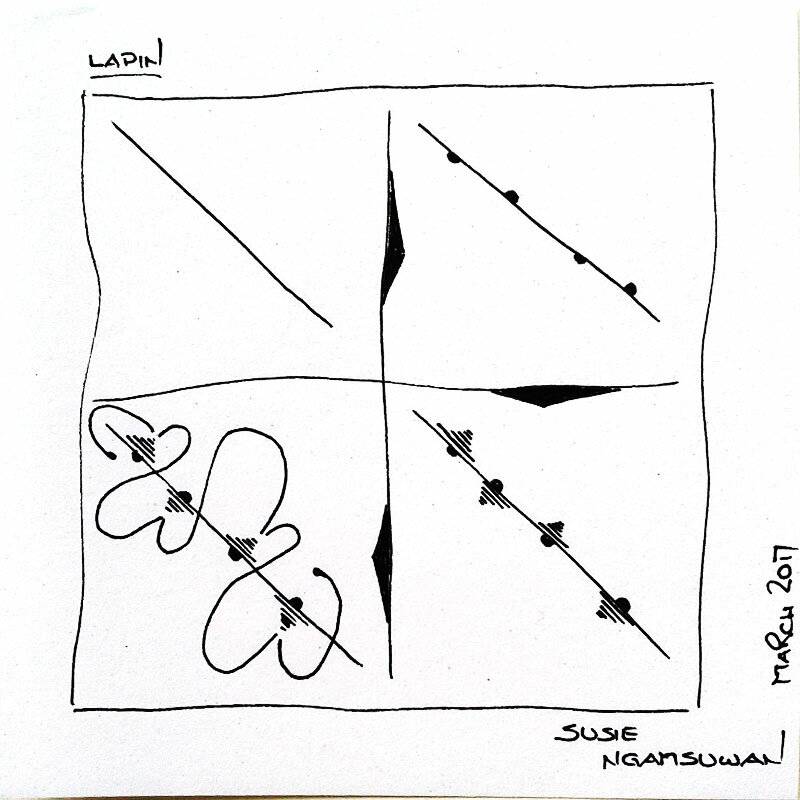 I made a composition that I have finished with Lapin (Susie Ngamsuwan) as a framework. And finally, you see another tile, inspired by. Laura’s challenge (311). I used : Cuttle, NKD, Patience, NZeppel and Peek-a-boo-Daisy. Of course I was quite happy with the challenge no 190 of Adele Bruno. She suggested a combination of Wind farm,Box Spirals. and Nouvart. Not a simple task but I saw wonderful results appearing and I thank Adele for this challenge and all participants for their commitment and interest. On Susie Ngamsuwan’s website I discovered a beautiful monotangle of Nouvart wich reminds me to ice crystals. Susie is a talented tangler who lives in Thailand. She can make something special and refreshing of every pattern and I admire her personal style. Reena Soni also shows a nice work in which she integrated Nouvart in a delicate way. (I met this sympathetic lady during the 22nd CZT seminar) You can follow her on instagram. To end,you see a picture of my contribution for her 7th mosaic. You can see the results of the participants on her site. On the 10 th of may, the 8th project will start. I’m already looking forward to join again. Everyone is welcome to be a part of a great mosaic and will receive a small personal mosaic afterwards. Thank you Annette for your commitment and creativity and I wish you succes for the next one! Many thanks for this great post, dear Ria! I love reading it and watching all the wonderful pictures. You created so many beautiful tiles! Your colored backgrounds are amazing! Thanks a lot for sharing! I’m always happy to “hear” from you dear Anja and I’m glad we share our love for flowers. On every post of you, I see a nice picture of them too. So it was time to draw some tiles with organic patterns, especially flowers. And yes, there are already a lot of beautiful tangles that I saw and wanted to share. I’m glad you like the blogpost. I’ll keep on doing my best to find something I really like and can inspire other tanglers too. Oh Ria, there is so much I want to say – where do I start? Well…. Thank you for this wonderful inspiring post. Thank you for all your beautiful tangle tiles you share with us. Thank you for being an animal advocate. Thank you for promoting a vegetarian diet and natural lifestyle (am a vegetarian since 1990 – that is longer than 20 years [smile]). Thank you for posting the Laflor video by Elena Babayants; now my fingers itch wanting to draw it just like her. Thank you for bringing up the wonky grid by Helen Williams. I picked that up from her as well (my latest wonky grid: with Faux Weave). Thank you for using my unofficial Lapin tangle pattern in one of our tiles, it looks stunning the way you drew it!!! Thank you for posting my ice crystal interpretation of YOUR Nouvart. Your pattern creations definitely make the rounds among us tanglers. Thank you for giving me (and others) so many ideas to try out again (!) in this post. Yes, I have a bleached tile waiting for me to be tangled – and a new candle tile. And last, but not least, thank you for coming into my digital life! Your ideas keep me busy – it is a wonderful ‘busy’. I’m really glad you like this blogpost. I have learned so much from others on the Internet (also from you) so it is nice to share something too. In fact, my favorite patterns are the organic ones and there are already so many little jewels, that is why I have tried to use them in this post as many as possible. This Laflor is wonderful isn’t it? And when you see this movie, so easy to draw and even to bring your own variations on…and Helen Williams, wow she is amazing… Very often, I take a look on her site. I like to experiment with different colors, materials, tangles… sometimes I like it at first sight, sometimes the result is not what I want but that is normal and I try again. I hope you will enjoy drawing on a bleached tile and I am sure your candle tile will be gorgeous. For me it is also nice to get contact with people all over the world and to share information by that way. Thank you very much Susie for this kind comment. I very much appreciated your inspiration and interpretation of what is around you to then capture it in your art pieces!! Lovely email! Thank you Barb, that is a very nice compliment that makes me really glad. I send you warm regards from Belgium and wish you succes and keep on tangling! Thank you Karen, I’m glad you like the pictures on my blogpost but to be honest I write and make the drawings, but my husband takes the pictures and put them on the blog. Nice drawing. so relaxing watching you draw. Thank you. Thank you MaryRita, I’m always happy with comments and I’m glad you like this post. I wish you a nice weekend with a lot of tanglepleasure! Thank you so much for the appreciation!!!! We have to meet again sometime and somehow …. I am moving to NYC in June so if you are ever there please please meet. ??? Thank you Reena for your comment. Very regulary I take a look on your beautiful work on Instagram. I’m sorry I can’t give you feedback by that way but you know, I like your art very much. I wish you succes with your art, your work, your family and especially now with your moving to NYC. Warm regards from Belgium.